memorable experiences for fans at TicketReturn.Com Field at Pelicans Ballpark. Applicants must be able to work nights, weekends and holidays. 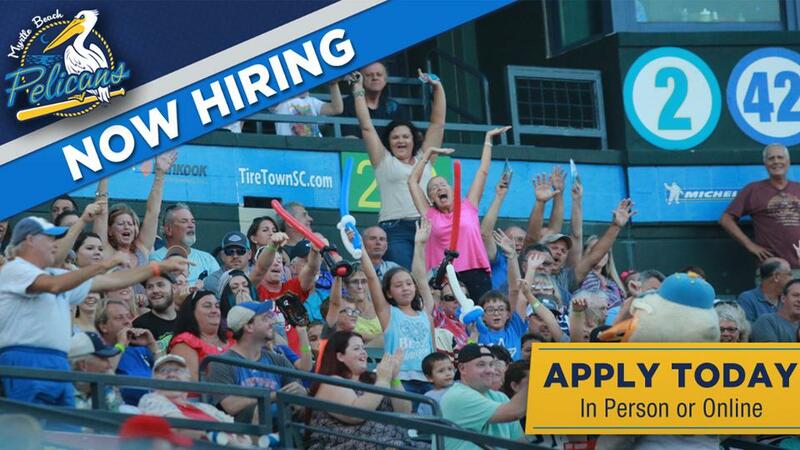 Applicants are encouraged to submit their application in person at the ballpark or via email to info@myrtlebeachpelicans.com. More information and applications are available at the Pelicans Front Office or online. The Front Office is open Monday through Friday, 9 a.m. to 5 p.m. The Myrtle Beach Pelicans are an equal opportunity employer; women, minorities and U.S. veterans are encouraged to apply. The Pelicans' 2019 season kicks off on April 4 against the Lynchburg Hillcats. Season tickets are available now. For more information or to purchase tickets visit myrtlebeachpelicans.com or call 843-918-6000.